For most people, the end of elections means listening to empty threats of moving to Canada, trying to fit lawn signs in trash cans, and finally returning to Pandora radio now that campaign ads are gone. But for many political workers it means unemployment. That’s one reason I didn’t work on a candidate’s campaign, but more importantly it reflects the fundamentally different approach that electoral campaigns take towards social change compared to community organizing. Campaign people operate with what I call the Campaign Brain. On Election Day, there can only be two outcomes: total victory or ultimate defeat. The sheer overwhelming number of voters that need to be contacted to win an election means an election worker’s interactions with each person must be short, efficient and transactional. They can essentially only be engaged in three ways– voting for candidate X, volunteering to tell other people about candidate X, or donating to the campaign. Most people working on the campaign are parachuted in a few months before and sent off quickly after the vote is won or lost. Even the Obama campaign, which put unprecedented resources into grassroots outreach, operated within the confines of the Campaign Brain. Despite using the language of community organizing during the election and building one of the largest organizations in the world, Organizing for America was for the most part abandoned. The void left by the Obama team’s weak engagement of its supporters after the election helped spawn the Tea Party’s rise to power. 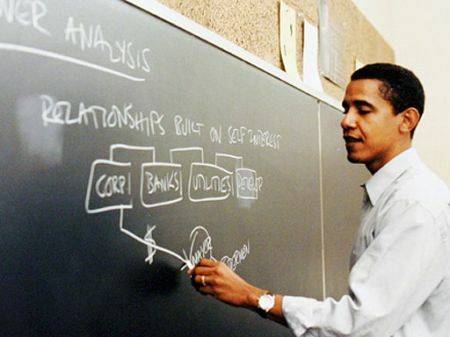 While the Obama administration folded OFA into a piece of the Democratic National Committee, the right-wing read Saul Alinsky and began community organizing. I want to note that I don’t think electoral politics is bad– it’s a crucial element of successful social movements. And innovative groups like California Calls and Virginia New Majority are integrating electoral politics with community organizing in visionary, strategic ways. I don’t even think the Campaign Brain is bad– it’s not bad or good, it’s just how you win an election. 1. Developing leaders for the long-term. Organizers try to move people along a leadership ladder. As they work to transform society, they also work to transform individuals, so that over years of political involvement, a housekeeper or a farmworker becomes an important community leader. Cesar Chavez tells how he was recruited by an organizer named Fred Ross, who knocked on his door over and over and was met with refusal, until ultimately his persistence led him to the breakthrough conversation where Chavez changed his mind and began his involvement in activism. The Campaign Brain doesn’t allow for this kind of investment in people. Even with volunteers, the goal of the campaign is to increase their involvement in terms of work-hours, not develop them after the campaign is over as leaders of their own. They are given little decision-making power, training, or ownership, simply because campaigns can’t function that way– the clock is ticking and they have to win. 2. Building relationships to organize communities. Campaigns’ relationships with community members start a couple months before Election Day and end immediately after. Campaigns know very little about their supporters because their conversations with them tend to be under five minutes. At most afterwards they get email updates about what the candidate is working on in the Capitol. Organizers know that to get people to overcome their fear and be interviewed by a reporter or speak at a city council meeting, the organizer has to build a close personal relationship with them and understand their deeper motivations. This involves a lot of sitting down and talking with them about their life that the Campaign Brain has no time for. 3. An analysis of power and its transformation. Campaigns don’t really talk about power. The candidate would probably seem creepy. But ultimately all attempts at social change are about the distribution of power. Period. You build an organization with a hundred thousand members because it creates power that didn’t exist before to accomplish change for the lives of those people. Social movements seek to transform systems of power– like creating a union so workers can negotiate with their boss rather than passively accepting working conditions. Campaigns seek to win within the existing systems of power– if suburban white professionals are more likely to vote, resources and messages will be mostly targeted at convincing them. This is just practical. But it means that campaign workers don’t spend much time analyzing what creates power in their community, growing organizations and bringing together coalitions. My point here is not to dismiss electoral work. It’s just to say that if you’re like me and want to learn a diversity of skills needed to create social change, there’s no substitute for spending some time as an organizer. Another way to look at campaigns is to see them as specific events on a timeline of social change. On November 6, 2012 voters came out and selected President Obama to once again represent them in the White House. California voters came out to the polls to help create a Democratic supermajority. Now organizations like CAUSE can help do what they do best and organize the community to look at Proposition 13 (work built on after other campaigns) and hopefully have backup from others who also went through the highs and lows of this political season. Maybe many of the relationships between the campaigns and the majority of voters will begin to fade but relationships with other community leaders are much stronger. Sometimes we have to work together on these discreet events before we can learn to work and win together.